The Russian President, Vladimir Putin, has denied planning to change the constitution to stay in office for a third term. Speaking to journalists in Moscow, he said Russia needed stability, and the best way to ensure that was by leaving the constitution unchanged. 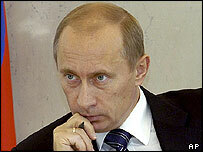 Mr Putin has repeatedly said he will step down at the next presidential elections in 2008. There had been speculation that a way might be found for him to stay on. Recent polls suggest more than 60% of Russians would like him to stand for a third term. BBC Russia analyst Steven Eke says that whatever has gone wrong in Russia on Mr Putin's watch, ordinary Russians blame his ministers, or parliament, but not the president himself. But critics say that, well into Mr Putin's second term, he has failed to fulfil pledges to reform housing, healthcare, education and the army. "I plan to leave the Kremlin in 2008, but I have no plans to leave Russia. And this is also a stabilising factor," he was quoted as saying. At the meeting with journalists, Mr Putin also denied that a new generation of oligarchs was emerging among state bureaucrats. "They do not own shares in these companies and do not earn dividends or salaries there," he said. But he admitted that corruption was a serious problem, saying "all countries with transitional economies and unstable political systems suffer from corruption".